Availability of healthy and quality food with zero impact on environment is one of our nowadays priorities. Local cultures and local food transformation automatically bring to transports reduction, less environment pollution, a simplified logistic, availability of fresher food in urban environments. Urban spaces for cultures are smallest in size but not for this less productive. One of our specializations is to study the settlement of aromatic plants, medicinal plants and vegetable crops cultures in urban environments (city gardens, roof tops gardens, vertical gardens, underground gardens). Hydroponics and aquaponics are soil-free methods which can be used to cultivate crops with high nutrients levels. Aquaponics combines hydroponics (soil-free crops cultivation) and aquaculture (fish culture) in a controlled environment, to create a balanced ecosystem that benefits the crops as well as the fish growth. As the fish grow, the tank becomes filled with excreta and other waste matter. Water needs to be changed frequently so that the fish can survive and flourish in clean water. The waste water from the fish tank, treated with natural bacteria, becomes a precious natural and valuable nutrient for plants. Pea, radish, coriander, arugula, mushrooms are only examples of what could be cultivated in underground farms built in unutilized underground tunnels or bunkers. A constant temperature of 15-16°C is ideal for cultures insuring no parasites growth; a LED system can be used to light the plants. 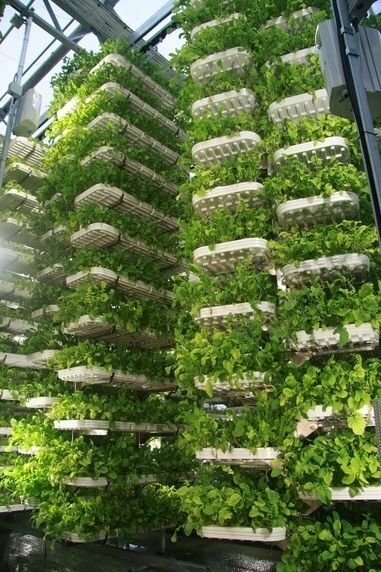 Underground farms can produce all year long fresh and tasty vegetables for local restaurants and supermarkets without pollute the environment and without occupying urban spaces.